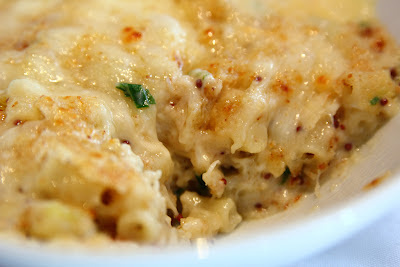 It's the weekend, and it's not like me to cook on weekend nights, but I about to make this baked macaroni and cheese...with a few special ingredients. Meanwhile, heat the milk in a small saucepan, but don't boil it. Melt 6 tablespoons of butter in a large (4 qt.) pot and add the flour. Cook over low heat for 2 minutes, stirring with a whisk. While whisking, add the hot milk and cook for a minutes or two more, until thickened and smooth. Off the heat, add the Gruyere, cheddar, 1 tablespoons salt, pepper, bacon, chives, and nutmeg. Add the cooked macaroni and stir well. Pour into a 3 quart baking dish. Slice the tomatoes and arrange on top (optional). Melt the remaining 2 tablespoons of butter, combine butter with fresh breaf crumbs, and sprinkle on top. Bake 30-35 minutes, or until the sauce is bubbly and macaroni is browned on the top. Hope you enjoy reading our blog, and trying this delicious recipe! my family doesn't like gruyere cheese, is there another that would be good?